an individual’s understanding of job expectations, the process for fulfilling these expectations, and the consequences of one’s performance. They recommend setting specific, challenging and attainable goals for both short and long term, at the individual and group levels, Let's break this definition down a little to see how it translates to actions. Understanding job expectations requires clear roles with clear goals, and plans of specific actions with timelines. That's ideal, but not always our reality. Who's responsibility is it to ensure understanding? The manager's? The employee's? The organization's? We already know the answer is all three. Understanding requires communication, participation and evaluation. There are starring roles for all players in each of those elements. ​The first two make the last possible, and go a long way to letting us work flexibly when understanding is grey. Processes include which tasks get performed, by whom and in which order, when they are finished, and all the tools used at each step. That's a huge part of your business to tackle! That word, "consequences," feels a little punitive to us - we like to say "outcomes." Outcomes of performance can include quality goals met, timelines achieved, stakeholders informed, dependent processes triggered, and other specific goals. ​Actions can also breed unmeasured outcomes - relationships enhanced (or damaged), process intentions honoured (or circumvented), or adjoining processes supported (or broken). Finally, consequences tie back to the most basic fundamental of human behaviour - rewards and punishments. ​ Preferably rewards. Sometimes an unintended outcome of structure leads to suppression of creativity, risk-taking and passion on your teams. Emergent Process Development identifies and works with the organization's natural energy to build processes that truly support teams and individuals for effective execution. As a rule of thumb, every process should earn its keep - that is, processes should not cost more to maintain than they save in cost, time or opportunity cost. It's tempting to assume that, if we just write it all down, make great process diagrams, create balanced scorecards, track dashboards, set SMART goals and measure the outcomes, that we have clarity. ​But it's possible we have less actual clarity about what matters to our business than we did before we had any way to track it. 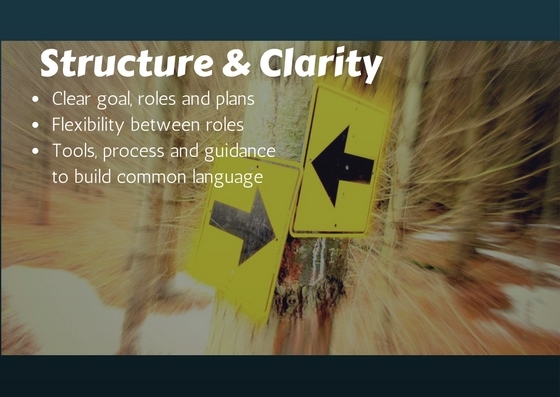 Clarity means stepping back to see the patterns in the bigger systems we engage. It requires setting aside specific time to talk, formally and informally, about what's really going on, and how the structures and goals correlate to the reality of daily work. Your needs are unique to you. Let's talk about how to bring more structure and clarity without losing the essence of creativity, innovation and value. Book a free consultation today!